← The Rest Of the Best Of 2016’s New Halloween Candy! 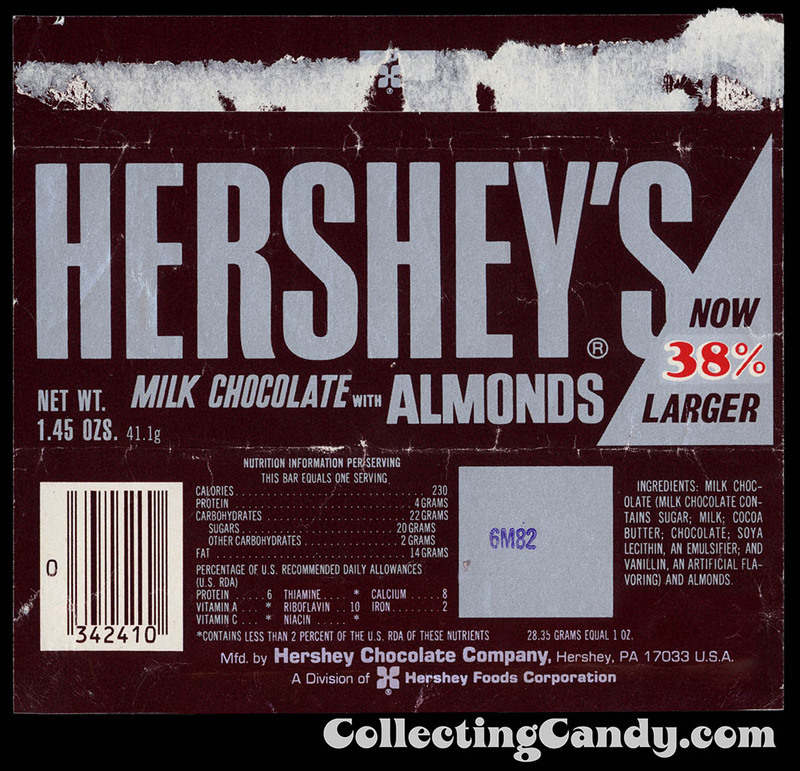 Way back in 1982, the Hershey company held a Summer promotion where they upped the size of each of their standard bars and alerted consumers to it with a bright on-pack call-out. 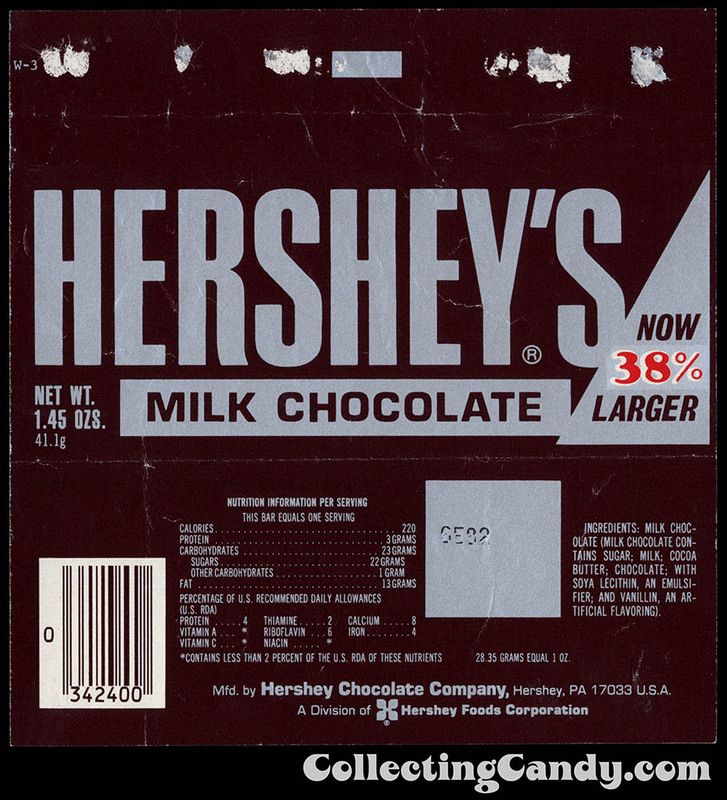 I call it the “Hershey’s Now Larger” promotion and you can check it out after the break. 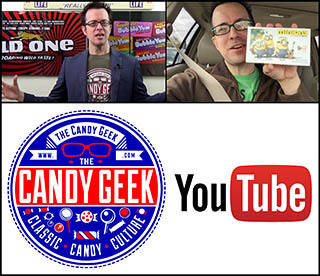 Today is the first installment of a new feature for CollectingCandy.com called “Full Set Fridays”. The plan with Full Set Fridays is to showcase, for lack of a better term, full sets of wrappers or packages. 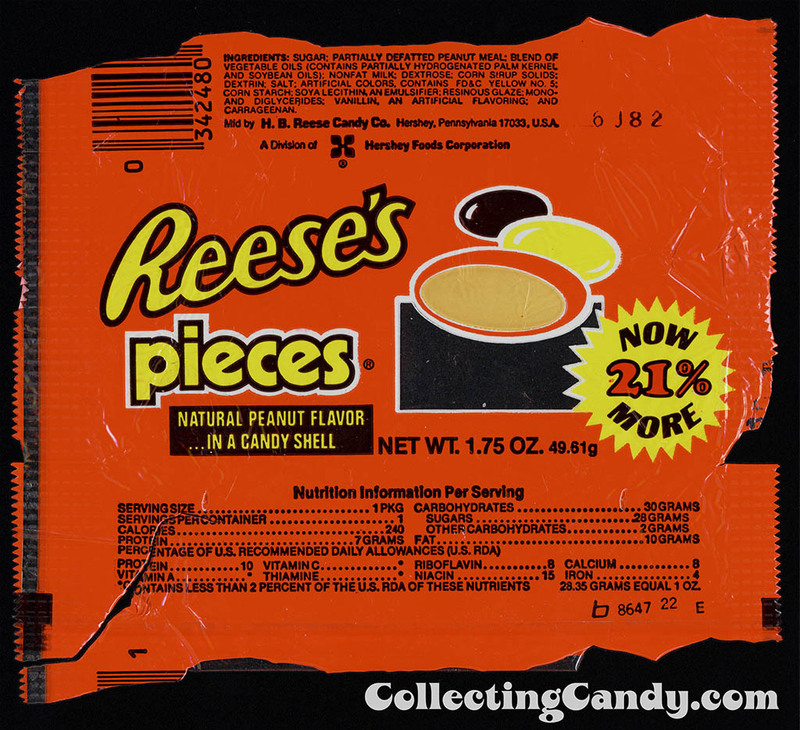 The thing about candy packaging is that, excepting in specific instances there aren’t really proper “sets”. 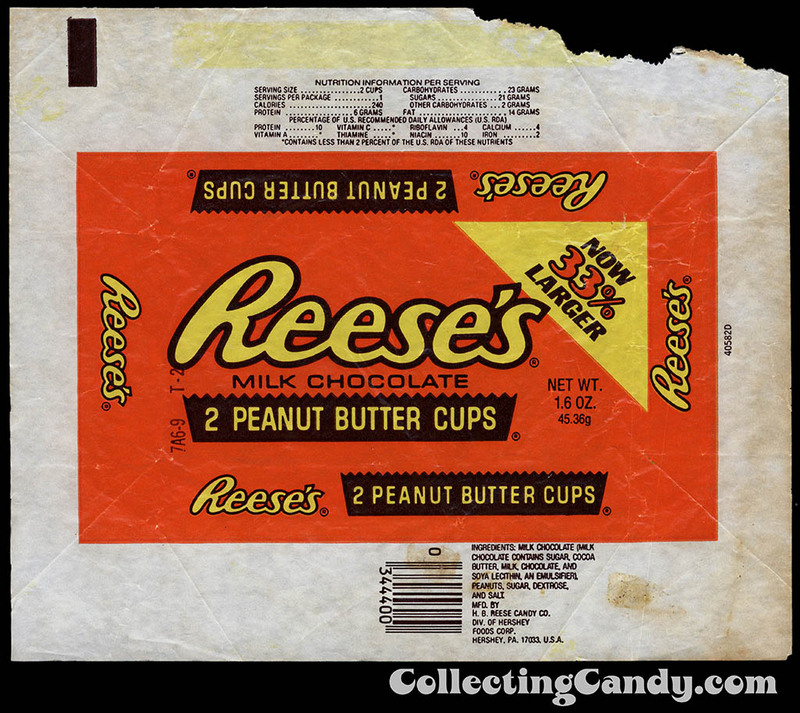 But as I endeavored to do early on here when I covered Hershey’s modern King Size wrappers and Mars’ 2-To-Go, it can be fun to collect and build sets of wrappers even if they don’t lend themselves to it. So in spite of the difficulty in doing so, where shared promotions and other thematic similarities are concerned, sets can reasonably be described and collected. That is certainly the case with today’s “Now Larger” set, so let’s get to it. 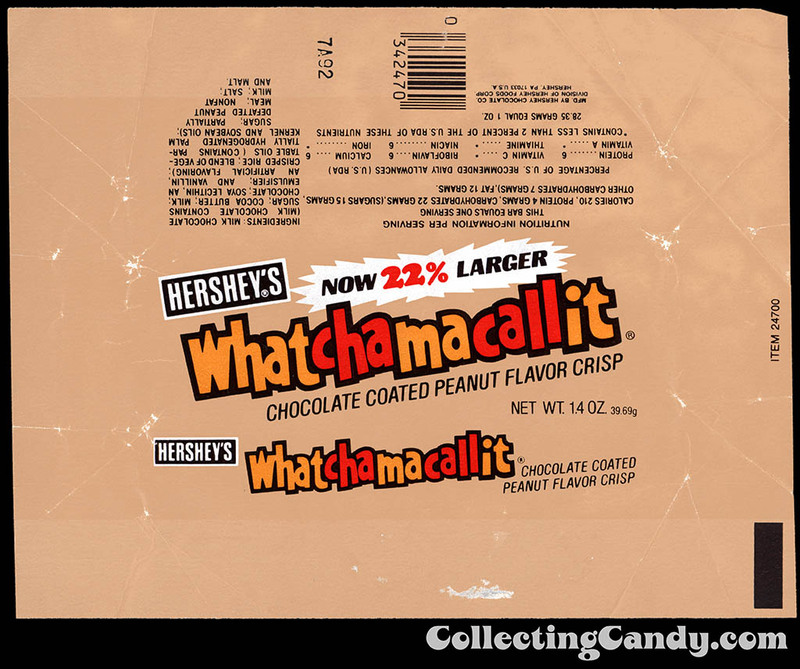 After so many years of wondering if I’d ever find one, that Whatchamacallit is a real beauty to now be able to share. 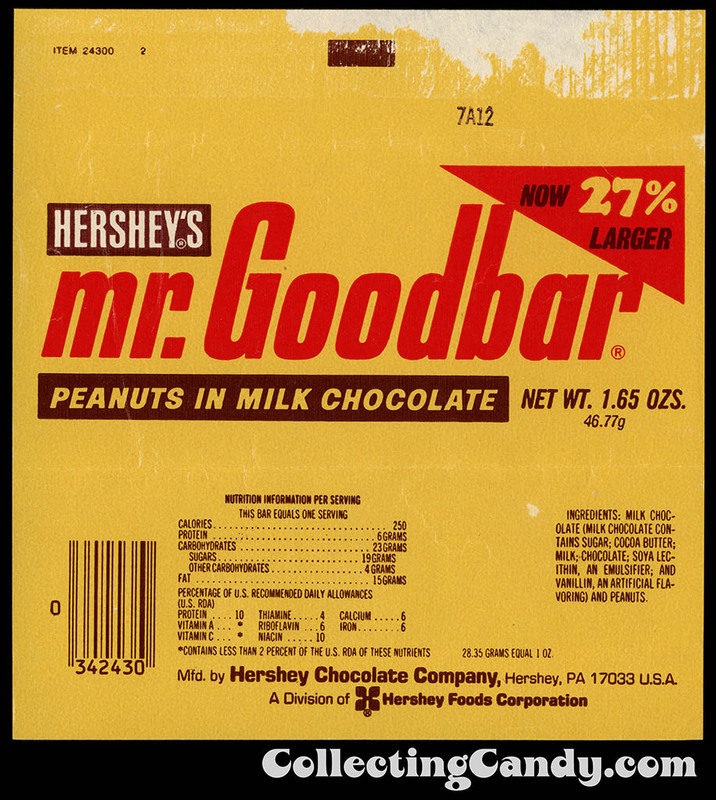 The final wrapper from this set that I still need is that from the “Now 21% Larger” Krackel bar. The last piece of the puzzle for a proper full set and one I hope to find in the years to come. 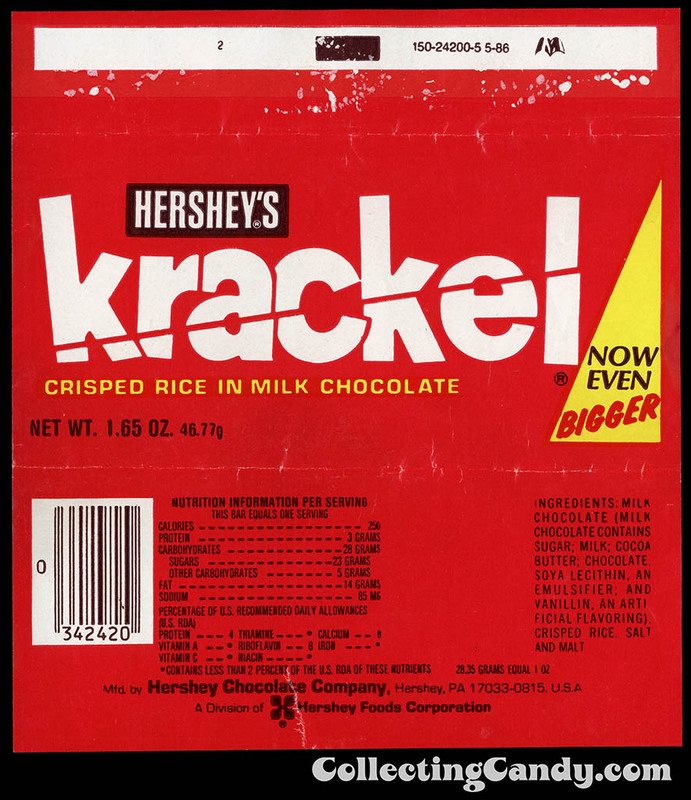 And while I don’t have that exact one, I do have a Krackel wrapper from a similar promotion, likely from a couple of years later. 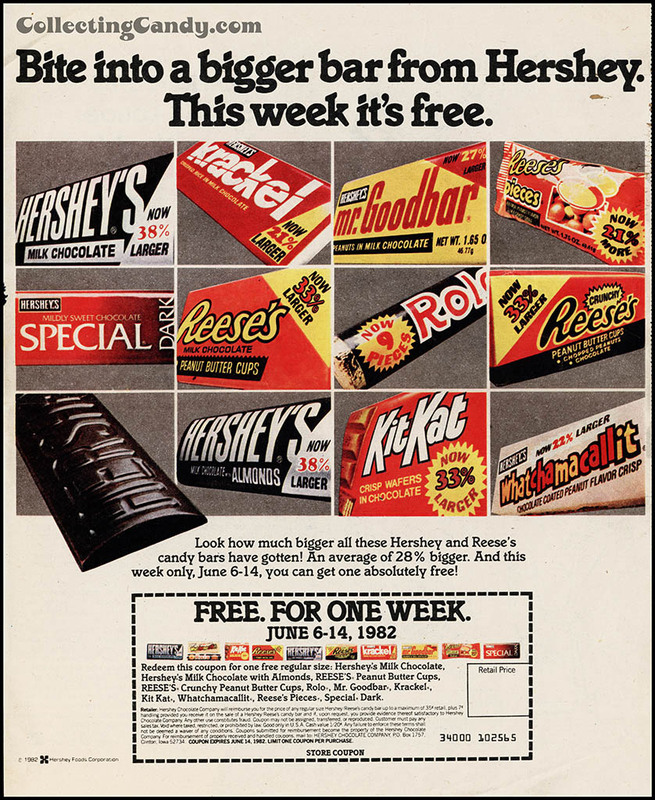 It’s worth noting that while Hershey’s Special Dark was included in the Now Larger promotional circular and coupon, the bar shown in the ad had no special call out or wrapper design – so I’ve come to believe that Hershey’s Special Dark did not actually change during this period. 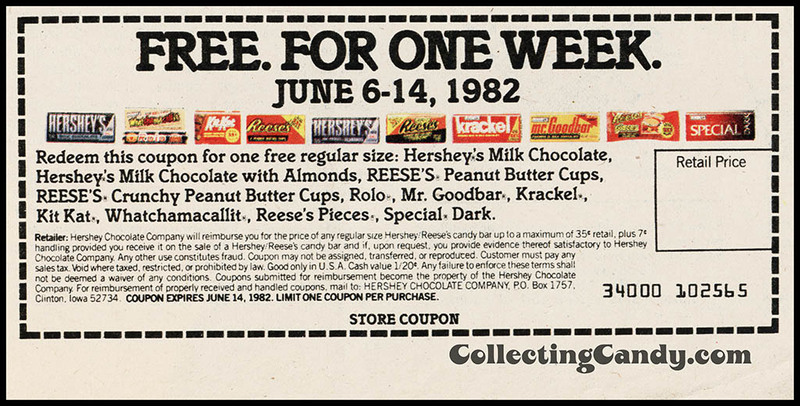 And that’s the Full Set (minus one) of Hershey’s Now Larger wrappers from 1982. But I do have one more piece to share. 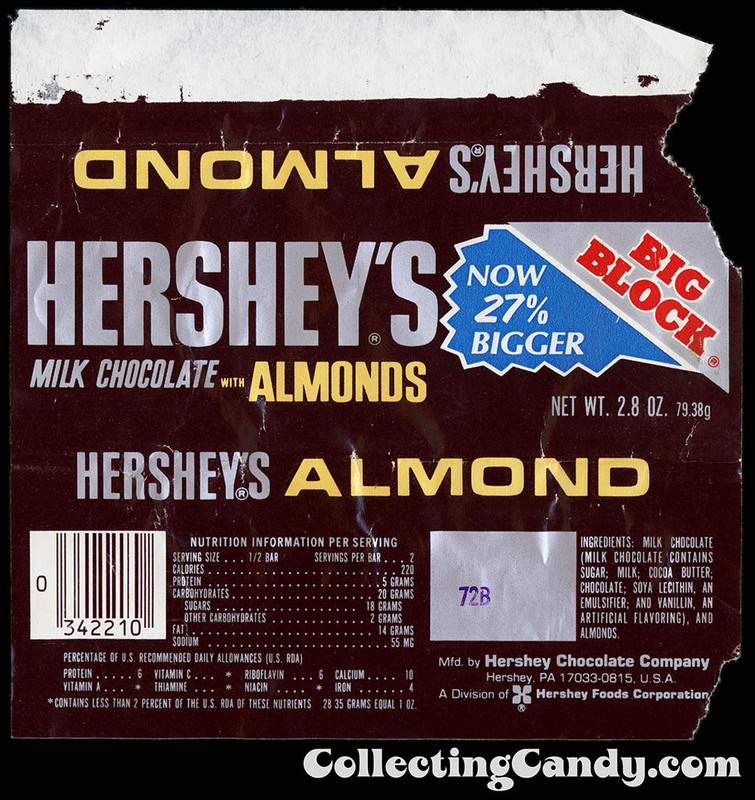 It’s a Hershey’s Big Block wrapper that had a “Now Bigger” call out of its own. 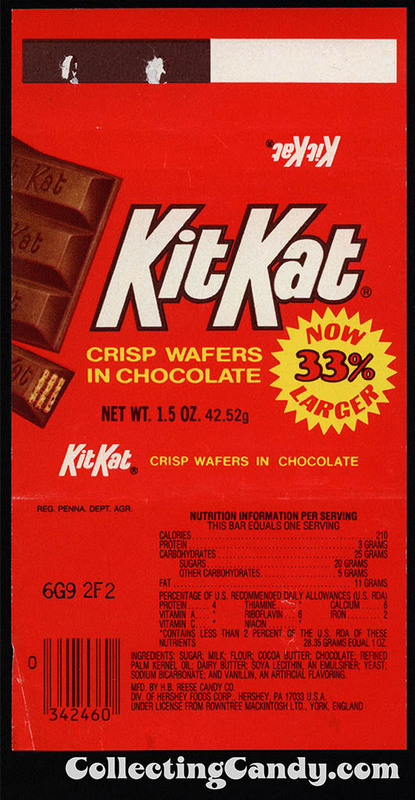 So while that’s the nearly full set of the 1982’s “Now Larger” wrappers, I’m left to wonder if there’s a complete set of “Now Bigger” wrappers from a few years later which also included the Big Block bars? If it is, it’s a set I’m sure I’ll be working to collect from this point forward. I’ve certainly got my work cut out for me, but what fun work it is. 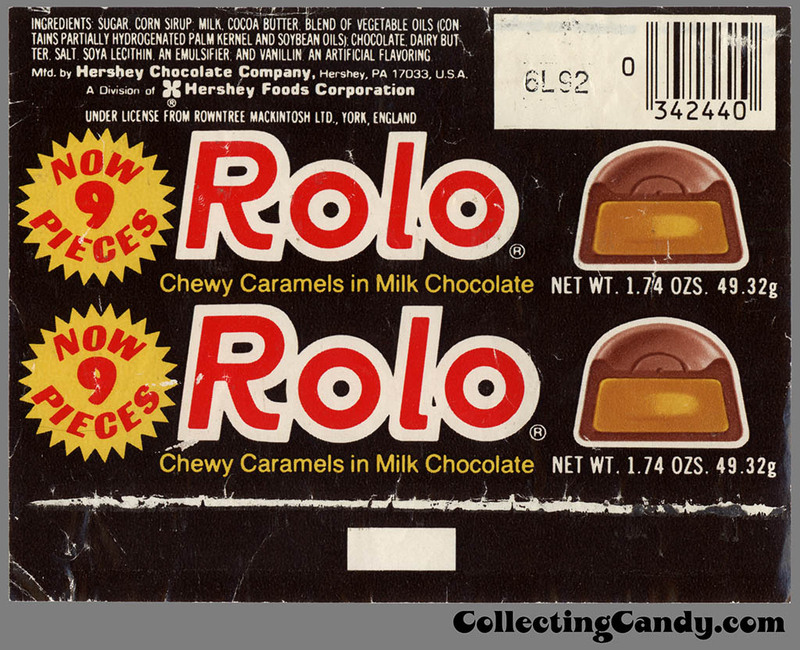 And that’s everything for today’s post and our first installment of CollectingCandy.com’s Full Set Fridays. Hope you enjoyed it and I’ll see you next time! 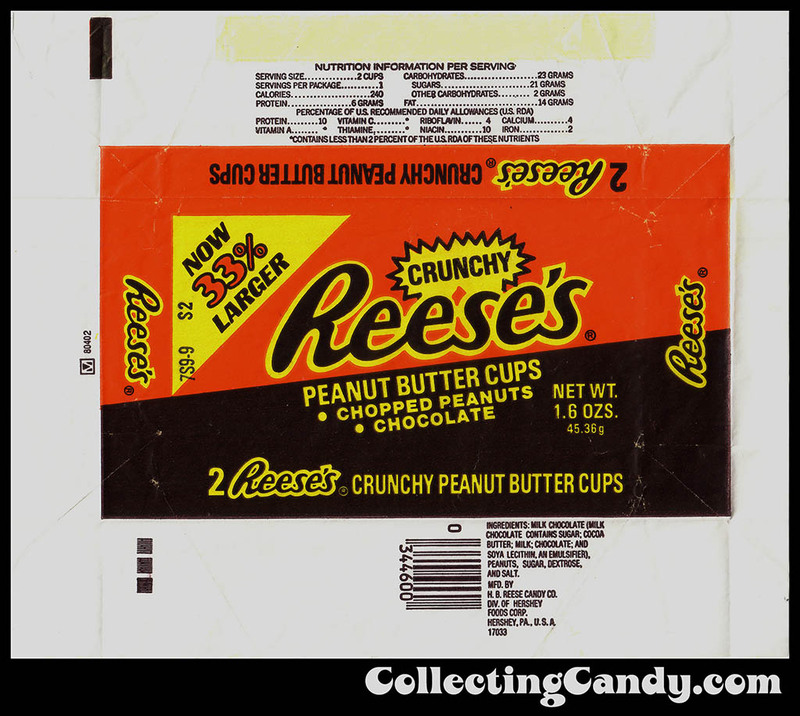 This entry was posted in 1980's, Chocolate, Full Set, Hershey and tagged 1980's, 1980's candy, 80's, 80's candy, 80's Hershey, candy collecting, candy collection, candy collector, candy wrapper collection, candy wrapper collector, collectible, collecting candy, confectionery, confections, full set, Hershey, Hershey's, packaging, packaging design, sweets, vintage candy wrappers, wrapper. Bookmark the permalink.